Shades are custom-drawn rectangles of color. They are more flexible than the basic shapes and can be re-sized more naturally. Shades can be used to create a key or legend, show horizontal lanes, show vertical windows, or even spotlight an activity or area of the network. Both shapes and shades are added through the same toolbar icon. Click the Shapes icon on the toolbar. Without releasing, drag the cursor to create the desired shape. Release the mouse. The Shade Object window will open. To make the shade entirely horizontal or vertical, click the dropdown next to Orientation and choose accordingly. Double-click the shade or right-click and choose Properties. Click the dropdown next to Behavior and choose Canvas Background to lock or Regular Object to unlock. NOTE: Even when unlocked, a shade will never be included when dragging to select other objects. To include one or more shades, first select the other objects, and the press the SHIFT key on the keyboard, clicking each shade individually. Left-click with the mouse on the desired shade. NOTE: Shades can only be moved in front of/behind one another, but not in front of/behind other shapes or images. To move, drag the shade without letting go to the new desired location. NOTE: If a horizontal or vertical shade is resized so that one of the edges no longer spans the entire width or length of the canvas, the shade’s orientation will automatically adjust to be Variable. Orientation Determines the overall shape of the shade. Variable shades take the exact shape that is drawn on the canvas. Horizontal shades span the entire width of the canvas, maintaining their upper and lower edges that are drawn. Vertical shades span the entire height of the canvas, maintaining the left and right edges that are drawn. Edge Type Determines what the edges of the shade correspond to. Snap to Period will align the left edge and the right edge with the beginning and end of each day (or time unit, when using PolyTime). Absolute will allow the left edge and right edge to fall in between the beginning and end of each day (or time unit). Behavior Determines whether or not a shade can be selected via left-click on the canvas. 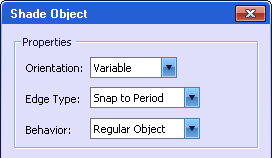 Regular Object enables selection via left-click on the canvas. Canvas background will lock it, and thus prevent selection. The Formatting section contains controls for changing the look of the object on the canvas. Color The color of the shade.